Firefighters are battling a massive fire at the Notre Dame de Paris cathedral. Videos from social media show flames shooting out of the historic building and smoke billowing into the sky. The fire started at 6:50 p.m. local time, according to city fire officials, who said it is spreading quickly. 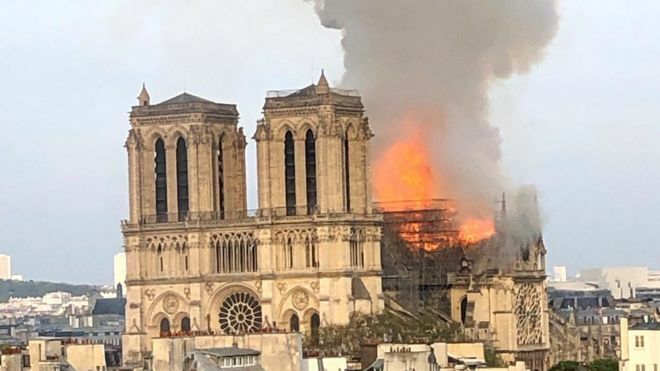 It does not look criminal and could be connected to recent restoration work of the church, according to officials. French media quoted the Paris fire brigade saving the fire is "potentially linked" to a 6 million-euro ($6.8 million) renovation project on the church's spire and its 250 tons of lead. It is unclear whether there are any injuries. Crowds stopped in their tracks along the Seine River, which passes under the island where the cathedral stands. Update: the Notre Dame spire has collapsed. The entire roof is engulfed in flames.